Welcome to money month on The Happy Arkansan! I decided that I wanted to dedicate all Wednesdays this month to talking about money and money management. 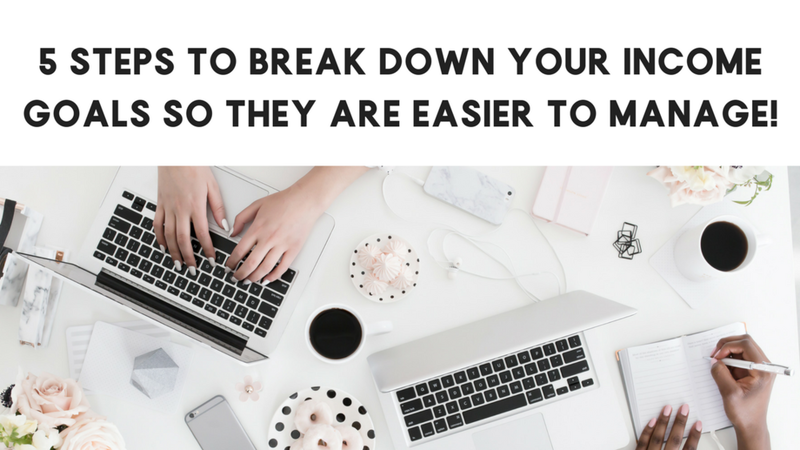 Today’s post is going to be about something that’s been near and dear to my heart lately–breaking up and breaking down your income goals. When you have a lot of money you want to make, looking at the huge figure can be difficult AF. You can use this no matter whether or not you are a student, an online content creator, or anything in between. Our first example is going to be a college student called Maggie Money. Maggie lives in Arkansas where she has a part-time job, an Etsy shop where she sells cute paintings, and occasionally she babysits to make ends meet. We also have Cassidy Cash. Cassidy is a blogger and a freelance writer. 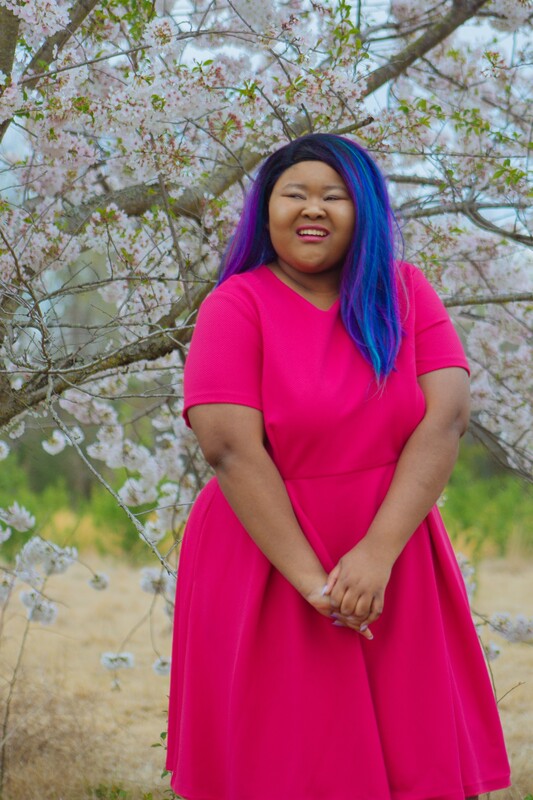 She creates sponsored posts for brands, does freelance writing work for clients, and she also has an e-book that she wrote to sell to her audience. Let’s see how these examples can break down their income goals to reach them effectively. As a note: I am not an income or tax expert. I am not factoring every minute detail into this post. There are some things that are hard to calculate exactly, but I am going to try my hardest to do that though. In order to break down your income goals, you need to know what your overall goal is. Base this on what you want/need, not what other people tell you that you want/need. At the end of the day, they won’t be working, you will so you need a number that reflects your needs. Maggie Money truly only needs about $1,000 a month. She isn’t on her own, but she would like to have a bit of income each month in order to save money, travel, or even just spend time with her friends on the weekend. Cassidy Cash is trying to make it on her own. She needs a good chunk of cash per month to live the life that she wants to. She has come up with wanting $3,500 per month coming her way. If you have any income that you know is going to come in each month, start with that. Maybe you have a steady job, maybe you won one of those $5,000 a week for the rest of your life prizes, or anything in between. We need to calculate that first and see what we have left over afterward. Maggie Money has a part-time job. Assuming she is working a minimum wage job (min. 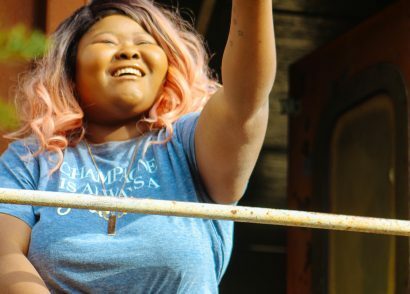 wage in Arkansas is $8.50 per hour) at 20 hours per week she would take home $154 per week after taxes and $616 per month. This means Maggie still needs to make $384 from other sources of income. Cassidy Cash doesn’t have a truly stable income, at least not in the statement we made up earlier. So, she still has to make it to $3,500 per month. The rest of breaking this down is a lot of trial, error, and followthrough. The rest of the equation is not so cut and dry, you have to follow through with your plans for how to make money. When you are working on your own to do the rest of these tasks, it’s gotta be up to you to make them happen. Let’s see how this might look. So, Maggie is selling her paintings on an Etsy shop. Let’s say that she sold each painting at $30. Maggie also needs to use $5 from each painting sold towards keeping up her supplies and she charged them extra for shipping (so it doesn’t factor into her money.) If she could sell 7 of those paintings at $30 per month that would be an extra $210 in her pocket, after supplies it would be closer to $175. Maggie also babysits. If she also charges at least the Arkansas minimum wage to do this ($8.50 an hour) Maggie can put in an extra 25 hours a month (or about 6 hours a week) and get an extra $212.50 towards her goal. This is a good job because likely Maggie can work on her homework so it’s not as hard as her part-time job, and she only has to do a few hours a week. Work 20 hours a week at her min. wage job which brings home $616 per month. Paint 7 paintings at $30 a piece which brings home $175 after supplies. Babysit for 25 hours a month at min. wage which brings home $212.50. In total, that’s $1,003.50 per month for her. Note: I didn’t factor taxes she would need to pay on her Etsy shop and babysitting gig as that would be a smidge too complicated, but this money is taxable. Cassidy Cash is a bit harder. We have no definite income for her. just a list of jobs that she does. So, we are going to have to make her goal of $3,500 per month work in some capacity. I am going to withhold 20% of her income as that’s a nice number that people say you should hold aside as a blogger and freelancer on your projects. Since Cassidy wants to end up with $3,500 she actually needs to make $4,375. One of the easiest ways to start a potential income break down for Cassidy would be to divide the income she wants by her income methods. So, since she has 3 income methods, each one needs to bring in about $1,459. So, let’s get to work on what that might look like. The great thing about sponsored posts, is that there is a good chance that you might be able to negotiate a rate that you feel comfortable with. Let’s say that her sponsored post rate is $200 a post and $100 for each social media post. She could easily do 5 sponsored blog posts a month to make the first $1,000 and then 5 sponsored social media posts to make an extra $500. Cassidy may want to take a simpler approach to calculate how much she needs to make in freelance writing. There are typically 4 weeks in a month, so she would simply divide $1,459 by 4 to see that she needs to make $364.75 in freelance work every week to make her goal. 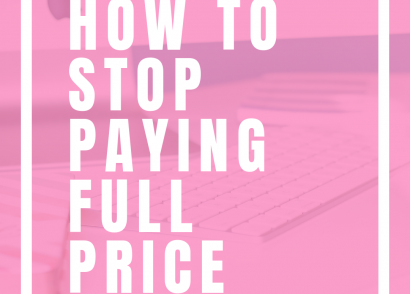 This may come from more than one client, or it may come from just one client, as long as she keeps on target with how much she wants to make each week. Okay, let’s say that Maggie wrote a fantastic e-book, and she sells each copy for $40. She can divide $1,459 by $40, and come up with the fact that she needs to sell 37 of her e-books each month or around 10 e-books each week. Creating 5 sponsored blog posts per month and 5 sponsored social media updates a month which gives her $1,500. Offering her services as a freelance writer which brings home $1459 per month. Selling 37 copies of her e-book a month which she sells for $40 which brings home $1,480 per month. You never want to put too many eggs into one of your income baskets. Break down your massive income goal into these tiny baskets, and make sure that it’s something that you can handle. Now that we have a plan, Maggie Money and Cassidy Cash would need to go out and make these things happen. Maggie Money needs to work those hours at her part-time job and as a babysitter and sell those paintings while Cassidy Cash has to work with those brands to create sponsored content, keep selling her freelance services, and keep selling copies of her book. Their plans have to be solid, and they have to work hard every week to make it happen. Okay, you may be looking at Maggie Money’s and Cassidy Cash’s to do list and think, “Wow, they have to do a lot to afford their lifestyle!” So, now we are going to talk about diversifying your income. They both have three streams of income, which is good, but did you know that there is a saying that on average millionaires have 7 different streams of income? We gotta diversify their strategies some more. When you diversify your income strategies, you want to look for ways that you can make more money doing what you are already doing OR how you can add another stream altogether. Let’s think about this for a second. Maggie Money has a lot going on in college and with her income streams, let’s see how we can make it easier on her. Yes, she makes $8.50, but imagine if she found a part-time job that paid $10 an hour? She could work the same hours, but now she takes home $178 per week instead of $154. This means that she would take home $712 per month from that job instead of $616, almost $100 more per month while working the same hours. Obviously, every cent she gets paid higher than $8.50 is going to bring her closer to her goal of making $1,000 per month. After she becomes a better babysitter, she can also take on higher paying clients for that. She could start charging $10 an hour for that at 25 hours a month and make $250 instead of $212.50 which brings home an extra $37.50. Maybe she wants to charge $40 per painting now that she has become better at it, assuming supply costs will stay pretty consistent at $5 a painting now she brings home $245 per month for 7 paintings instead of $175. All-in-all with just a few tweaks she is taking home $1,207 per month instead of $1,003,50 per month while doing the same amount of work each month. It’s insane that a few small tweaks can change how much someone makes! Decide to sell other things besides paintings on her Etsy shop by selling products like shirts and mugs with her art on them. In order to make this process easier, she may use a drop shipper so she doesn’t have to put money up front or package up anything from her home. Start selling paintings locally. To build up her local clientele Maggie may decide to go to some trade shows and galleries to sell her art. Create an art-focused YouTube channel. Maggie may want to teach other’s how to create art or showcase her paintings on YouTube to get more clients for her Etsy shop and profit from YouTube revenue. Coach other artists. If Maggie is great at art she may want to hold painting classes or coach people on how to make money as an artist. Sell art prints. If Maggie decides that painting new art all the time gets tiresome, she may find a way to digitize her art so that she can sell it in art print form instead of in physical form that way she can sell more art each week and spend less on supplies. Maggie has so many choices on how she might decide to switch up her income and create more of it in the process. It starts of small, but it can grow quickly from there. Currently, Cassidy’s sponsored post rate is $200 for blog posts and $100 for social media updates. If Cassidy raised her sponsored post rate to $300 and her social media updates rate to $150, Cassidy would make $1500 per month from 5 sponsored blog posts and $750 per month from sponsored social media posts. This means she would make $2,250 per month all while doing the same amount of sponsored blogs and social media updates. This is an increase of $750 per month. Cassidy currently strives to take on $364.75 in freelance clients per week, but if she raised that by just $75 per week to $439.75 per week she would take home about $1,759 per week instead of $1,459. This is an increase of $300 per month. After a while of selling her e-book, Cassidy may decide to update the e-book contents, add more information, and then up the price of her e-book just a bit. Instead of charging $40, she may want to update the price to $50. Now she would take home 1,850 per month by selling the same 37 copies instead of $1,480. This is an increase of $370 per month. With these small adjustments, Cassidy now brings in $5,859 before she sets aside 20% for taxes and $4,687.20 after she sets aside money for taxes. Release a few more e-books so that she can capture different audience members, as well as encourage repeat purchasers. Become a coach to other bloggers and business owners to teach them how to run their business and make a profit online. Invest in learning about affiliate marketing so she can create a new way to make money with her blog. Learn new writing skills for her freelance business so that she can offer more freelancing services. 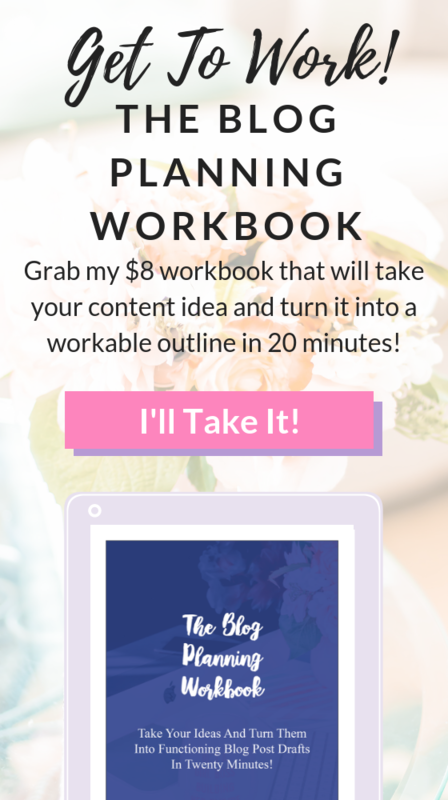 Create a course for people who want behind the scenes on how she makes money as a blogger or as a freelance writer. Cassidy has a lot of options for how she can expand her online business to make more money. 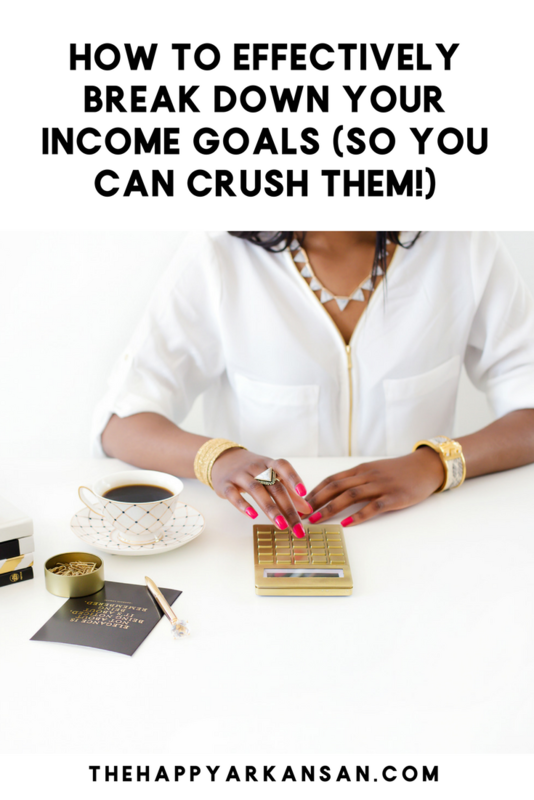 Yep, we just went way in-depth on how to break down your income goals, but next, you gotta get to work. Yep, you gotta get busy doing whatever it is that you want to do. You gotta take a page from Britney Spears and get to work. It’s going to take time, energy, and effort to build up your income into what you want it to be. I know that you can make it to your income goals, though! We will make it to our goals together! Also, be willing to walk away if you put your heart into something, promoted it, and it’s just not working like you intended. You have to work towards things that are making you money or giving you the intended results. You don’t have to stay on a sinking ship if you don’t want to do so! There you have it, a complex way to get to your goals with a ton of examples to help you along the way thanks to our fake awesome ladies Maggie Money and Cassidy Cash. Are you ready to put in the work and break down your income goals? I hope so!